A shave horse is a combination of a vice and a workbench, providing a rapid and sturdy clamping mechanism for shaping wood. Historically shave horses have been used in many applications such as chair making, spoon carving, and coopering. We’ve designed ours to be sturdy yet collapsible - perfect for apartment living. 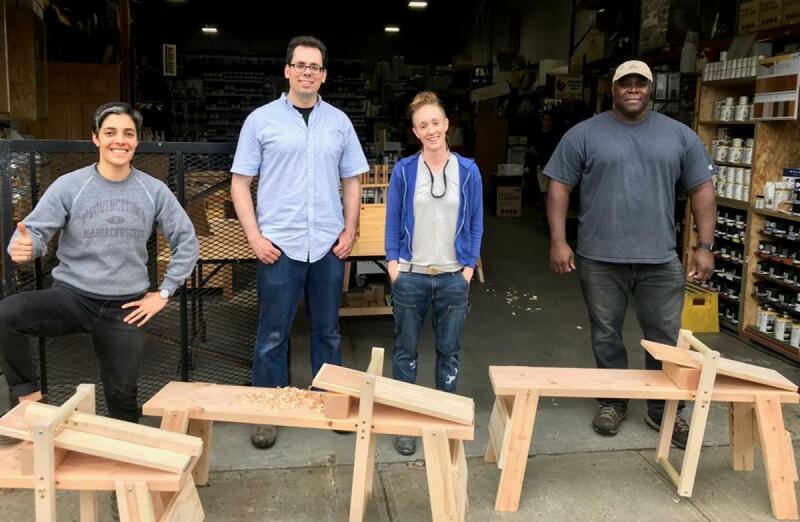 In this workshop students will assemble their very own apartment-friendly collapsible shave horse, and leave with a little sawdust in their pockets. Students will practice cut layout; miter- and hand-sawing; drilling, hardware installation and assembly. When you are all done you will be ready to tackle spoon carving, chairmaking, and a host of other traditional crafts. (We'll give you spoon blank stock to get you started.) And you and your apartment will have a brand new shave horse you made yourself. This is a fast-paced, hands-on class. Tuition includes all tools and materials. Class participants must bring or purchase safety glasses or goggles and sign a safety waiver. Click here for more information and to register for the class. Class fee: $250 instruction fee + $75 materials fee (total = $325). For those of us unable to travel to you, might there be plans for purchase? I saw this shavehorse in your showroom a few weeks ago and was immediately intrigued. Regrettably I cannot attend the workshop. I hope it is a great success! Do you have plans or a cut list available for this project? I live in Virginia and would not be able to attend the class. Another request for making the shave horse plans available for sale. would like to buy a simple shave horse for home hobbies.........any suggestions? I live in Idaho. Down in Texas--too far away to make the class. Sell plans please! Most definitely! Shave horse plans for sale! What an intriguing project, I love the collapsible aspect of this, I have been on a quest to really downsize my work space in my garage, and this would be a perfect small fit. Great class. But yes, if in the future you would consider the plans available here, that would be very beneficial for many I think.